I am so sick and tired of BMW drivers and their attitudes on the road.Today I was coming onto the N1 from the Samrand off ramp and there is a lot of building going on there so practically while you are driving before you know it you are on the highway.Now its up to the drivers on the highway who see you coming to slow down because you just cannot stop on that off ramp as the cars behind you also dont realise the road is ending so you really could end up in an accident.Anyway this BMW "driver" just kept on going.Really I think that before you buy a BMW they assess you to make sure you have the bad attitude required to own a BMW. The worst thing is your car might be worth way more than theirs or their BMW could be a 100 years old but they still lord it on the roads thinking they are superior to everyone else. Yes I have given stress tips on making excuses for other drivers and so forth but BMW drivers do not fall under that list.They are just arrogant and make me sick.Thats why there will be no BMWs in heaven because only good people go to heaven and good people would not qualify to own a BMW. You know we get told to be positive and try to wake up with a bounce and every day is the first day of the rest of our lives?Well how does that affect us?We wake up expecting each day to be wonderful and normally what happens is we are bombarded with the daily stresses of just getting through one day.I believe we are hit harder by the belief that nothing bad will happen.I think what we should do is expect that each day will have trouble.In fact we should welcome all of these daily stresses and see them as obstacles to be conquered and from the experience we then grow as individuals.Only if a day has passed and no obstacles were encountered then we can get safely into bed and say thank you.But be prepared for tomorrow. I decided to start having this attitude from yesterday Monday 2 March 2009.I decided to take the day off work and go shopping with my 4 year old for a plastic baby pool.We got dressed and my little one was so excited.We get into my car and it would not start.It was perfectly fine the evening before(less than 10 hours ago)and there were no lights flashing or warnings that something was wrong.Just would not start!!! !Bearing in mind that the car is 1 year old,the logical thing to assume was that it was either the battery or no water or no oil.Something trivial like that right? 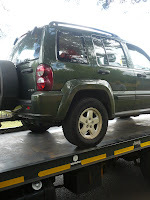 Checked the water.Water fine.Then called the breakdown service.Little man rushed over with his battery clamp thingys.He first tried to start and said no,the battery is fine.He hurried left with his battery thingy and said the car must get towed in. 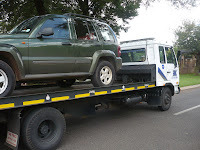 I called the office and related what the little man said and soon afterwards a big flatbed truck pitched up to take my car away.Because it is an automatic it could not be towed and had to be placed on the flatbed truck. So anyway off went my car and I then had to borrow the spare car of dearest love(which he has been trying to sell for 1 year now) and off we went to do our shopping which was done at superspeed and in no time little on was swimming away in baby pool.All happy!!! Come today I had to go to work.This car has a circular crack in windscreen right in front of driver vision and when I had to remove stock from the boot I had to hold the boot on my shoulder because it does not stay open on its own.And then the alarm activated and would not switch off.And then I finished my day's job and I came home.I also noticed a lot of people running in all directions everytime I would pull away and then realised that the exhaust must have a hole in it because of the noise and pulling away obviously makes it more noisy and the poor people thought I was revving the engine in anticipation of driving over them. 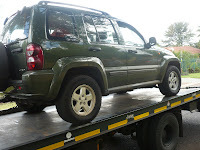 Anyway I got home and the repair center called and said come pick up your car which I did and have been happy ever since.Apparently the lift gadget thingy which controls the flow of fuel to the engine had broken and so this was replaced.Thank goodness I have a maintenance plan. Also when this same car was 6 months old the automatic gear box just stopped working.The car stayed in first gear and I was on the highway doing 20KM per hour and it was revving 5000 revs but would not change from first gear and then after 5000 rev would eventually change and then I would pick up speed and then some car would cause me to have to slow down and the whole process would start over again.I also pulled over onto the yellow line and was checking the flow of the traffic and when I turned to look into my car again there was a strange man sitting in the passenger seat.He thought I had stopped for him and I informed him that my car was not working and he told me thats ok he is just going to sit for a while because he is really tired of walking.Anyway I then started off again on my 20KM/hour journey with a passenger for company and I dropped him off really close to where he wanted to go but the journey had taken really long for him and his parting words were that he was going to be late for church. About the silver lining on the cloud?? ?Well every time my car breaks down the repair center fixes it and then cleans it thoroughly so I dont have to wash it for that week. How's that for a silver lined cloud? In this modern world central to our life and a great form of stress is ensuring our own safety and the safety of our family.We can install alarms in our home and employ security companies but once we are out of our home's comfort zone we always feel vulnerable.Learning how to defend ourselves will provide a degree of confidence which relates int a form of stress management.Learning aikido will show you how to protect yourself,provide some peace within yourself that you are being pro active about ensuring your safety and first and foremost one of its main lessons is teaching calmness in the face of adversity.This power to remaining calm will not only save your life if you were in a dangerous physical situation but will also help you to manage life's stress better. Aikido is a unique form of martial art. Its emphasis lies on the harmonious fusion of mind and body with the natural laws of Nature. Aikido focuses on accepting and respecting the energy of life and nature and channeling this harmony onto techniques that expresses this energy in physical forms. Aikido is often viewed as more of a defensive martial art since its techniques and teachings are designed for you to avoid or get out of trouble. On the contrary, Aikido's techniques are very powerful and effective. Basically, there are four levels of technique in Aikido training. These are the katai which refers to the basic training and is intended to build the foundation of body movements and breathing; the yawarakai trains the defendant to deflect attacks and fuse movements to take control of the attacker or situation; the ki-no-nagare which involves training the defendant to defend or counter attack by merging his movement with the attacker even before the latter makes contact; and the ki which is the absolute Aikido technique and involves establishing a link of ki or spirit from the defender to the attacker. When training for Aikido, you need a sparring partner. The uke and the nage. The Uke is the initiator of the attack and receives the Aikido techniques, while the Nage is the defender and the one that neutralizes the attack. Wherein the hand gripping the wrist is inverted and is quite useful in weapon take-aways; shihnage or the four-direction throw; kotegaeshi or wrist return which involves a wristlock-throw that stretches the extensor digitorum; kokynage also known as breath throws or timing throws; iriminage or entering-body throws which resembles a "clothesline" technique; tenchinage or heaven-and-earth throw; koshinage or the Aikido's version of the hip throw; jinage or the shaped-like-'ten'-throw; and kaitennage or rotation throw wherein the nage sweeps the arm of the uke back until it locks the shoulder joint after which the nage applies forward pressure to throw the attacker. These are just basic techniques and from the list of thousands of possible implementations or combinations can be drawn by the aikidokas. In Aikido, the strikes employed during the implementation of the Aikido technique are called atemi. For beginners, grabs are the first ones to be taught. It is safer and the aikidoka can easily feel the energy flowing from the uke to the nage. Among the basic grab techniques are the katate-dori or single-hand-grab which involves using one hand to grab one wrist; morote-dori or both-hands-grab which uses both hands to grab one wrist; ryte-dori another both-hands-grab technique wherein both hands are used to grab both wrists; kata-dori or the shoulder-grab technique; and the mune-dori or chest-grab which involves grabbing the clothing of the chest of the attacker. Mastering each technique involves discipline and dedication. To be a good aikodoka, one must master both the techniques and principle of the marital art. Below is the link to a cd where it teaches Aikido and self defense.